How does the Matthew Shepard and James Byrd, Jr. Hate Crimes Prevention Act expand protections against hate crimes? Who were Matthew Shepard and James Byrd, Jr.? 1. The hate-crimes legislation recently passed by Congress is officially known as the Matthew Shepard and James Byrd, Jr. Hate Crimes Prevention Act. Congressional acts often are named for specific people, but time can erase the memory of their connections to important issues. As a class, share what you already know about Shepard and Byrd. How did hate crimes affect their lives? 2. Your teacher will divide the class into two groups, with one representing Matthew Shepard and the other representing James Byrd, Jr. Each group will be asked to first read their different primary source documents. Then, they will research, write and perform a monologue from the point of view of one of the men. Within your group, assign individual students – or pairs of students – to the following: research; scriptwriting; costume, prop and set design; and performance. 3. Based on your research, write a 10-minute monologue that allows the student delivering the performance to educate his audience about the incident that ended his life. A simple costume and props should be used effectively to help tell the story. 4. Designate a class period to perform “Two Stories of Hate Crime.” Following the performances, discuss what you’ve added to your knowledge of Shepard and Byrd and how their lives have shaped the social justice movement. 1. The most recent federal hate crimes law expands on one that was passed in 1969. Individually or in pairs, prepare to contrast and compare the two documents. Both the 1969 law and the Hate Crimes Prevention Act are available online. 4. Share the results of your comparison in an oral or written report. Based on the changes made in hate-crime legislation in the past 40 years, what do you imagine future expansion of the law might – or should – include? Add your prediction to your report. Reprinted with permission. Teachers may purchase individual cartoons for lesson plans at PoliticalCartoons.com. This cartoon was originally drawn on September 13, 2001. Based on this information, who might have been the “them” to which Cagle refers? If you are unsure, ask older students or family members what they recall about that time. What reaction to this group of people does Cagle’s cartoon describe? 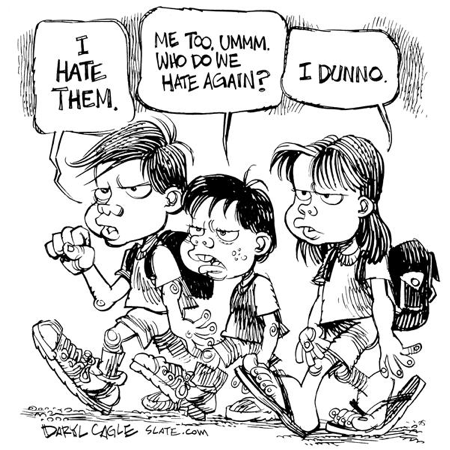 As a class, discuss whether these attitudes have changed since the cartoon was first drawn. If so, how? What might have caused those attitudes to change? Today is the 11th anniversary of the death of Matthew Shepard. I don’t think anyone can contemplate this date without a mix of strong emotions. But for me, the date always brings a special blend of anger, shame and guilt.